In today’s world of technology, computer users are faced with the constant threat of security issues. One wrong click of the mouse and your computer can be instantly crippled. It is not only important that you are aware of the types of threats that are out there, but you should also be familiar with the steps you can take to protect yourself. Such security threats are collectively known as malware. 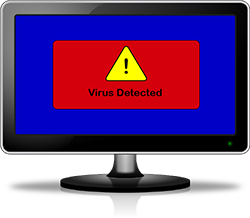 The term malware is short for malicious software and references a variety of forms of intrusive software. It encompasses ransomware, spyware, viruses, email spoofing and multiple other malicious programs. What’s Lurking Behind Your Next Click? Computer Virus – A computer virus is a self-replicating program that can be spread via email or also by inserting copies of itself into other computer programs or documents. Viruses can lead to the inoperability of your computer and spread quickly to the computers of everyone you share files with or correspond with via email. Ransomware – Like it sounds, ransomware literally holds a computer ransom by rendering it inoperable and attempts to extort “ransom” money from the unsuspecting victim. Ransomware is typically acquired via email messages and can be spread rapidly throughout the network. Spyware – Spyware is an executable program that is extremely difficult to detect and has the ability of secretly gathering personal information about you or your company. Generally, it is not created to cause damage to your computer. However, it is utilized to monitor keystrokes, copy files and gather information about you. Spyware is most often installed on your computer with something you have clicked on, such as a pop-up ad, browser add-ons, or piggybacked on another software installation. Email Spoofing – Email spoofing refers to sending emails with a sender address that is forged to make it look like it is sent from someone or somewhere other than where it came from. The sender of the email is hoping that the recipient will believe the forged address is from a legitimate person or company and will open it. Generally, spoof emails are more of a nuisance than anything, but they can contain links which install spyware, ransomware or viruses. The good news is that it is relatively easy to protect yourself from all the above-mentioned security attacks. In most cases, your IT person will have already taken measures to protect the network by installing firewalls, virus protection software and deploying DNS protection. The real question at hand is what can you do to help with the security of your information? Careful Clicking – Do not click on email attachments or links if you do not know the sender and you are not expecting the document. It is always best to open a browser and manually navigate to the website rather than click on a link which may or may not take you where you intend. Also, take a moment to run a virus scan on any attachments prior to opening them. Smart Surfing – Always utilize pop-up blockers within your web browser and never enter personal, financial or any other sensitive information into any web browser that you have not manually navigated to. Perform Routine Scans – At times, spyware threats and viruses can slip through the active protective engines due to the sheer number of new threats that are created daily. It is crucial that you update your malware protection and run system scans consistently. Take these simple precautions to protect yourself from a software security breach. While all of this malware fear may seem a bit overwhelming, if you educate yourself, remain alert, and follow the measures listed above, your surfing and clicking will be worry free. Remember, keeping your data safe and secure is easily manageable.